Stephen M. Black is a Regents’ Professor at Georgia Regents University and a highly respected member of the medical community. In recent years, Stephen M. Black has shifted his focus to research and has a number of active grants. One topic covered by grants is acute lung injury. In his studies, he has discovered that exposure to flavoring chemicals may be linked to lung disease. 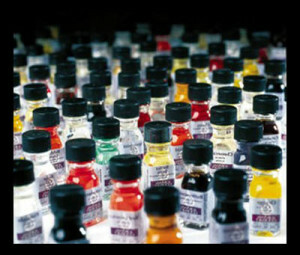 Flavorings, which are mixtures of both natural and man-made substances, are added to foods to enhance the taste. While the Food and Drug Administration recognizes these flavorings as safe to eat, they are still harmful in certain forms and amounts. Factory workers who are exposed to the chemicals for a prolonged period of time are most at risk. According to the NIOSH Alert: Preventing Lung Disease in Workers Who Use or Make Flavorings, the flavorings industry has estimated nearly 1,000 flavoring ingredients with irritant and volatile properties that could irritate the eyes, skin, and result in respiratory problems. Applying heat to the chemicals can also increase exposure. Industries who manufacture products with Diacetyl chemicals (butter flavoring chemicals), such as popcorn, can cause severe lung disease in workers. The Occupational Safety and Health Administration offers protection to workers exposed to diacetyl, but no specific standards are in place to protect from occupational exposure. 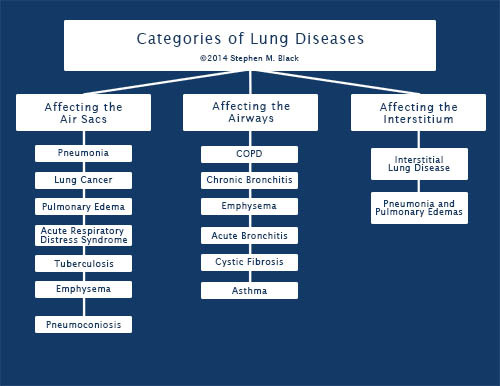 Stephen M. Black has categorized Lung Diseases into 3 different groups. Stephen M. Black is a research chemist who specializes in Molecular Pharmacology and Molecular Endocrinology. Recently, he and his team of researchers have uncovered a new therapeutic treatment target for treating acute lung injury. To understand how this treatment works, it is important to understand the many diseases that can greatly affect a person’s quality of life. Unfortunately, lung diseases are quite common and ten of millions suffer from lung disease in the United States alone. Frequent causes of lung disease can be attributed to genetics, infections, and smoking. The number of lung diseases are plentiful, and can break down into three categories: lung diseases that affect the air sacs, lung diseases that affect the airways, and lung diseases that affect the interstitium. Pneumonia: an infection usually caused by bacteria that affects the alveoli. Lung cancer: often occurs in the main part of the lung, near the air sacs and have many forms. Pulmonary edema: caused when fluid leaks from the lung’s small blood vessels into the air sacs. Acute respiratory distress syndrome: sudden, severe injury to the lungs that usually requires mechanical ventilation until they recover. Tuberculosis: slowly progressive pneumonia caused by Mycobacterium tuberculosis. Emphysema: a result of damage to the connections between alveoli, typically caused by smoking. Pneumoconiosis: conditions caused by the inhalation of dangerous substances that injure the lungs. Chronic obstructive pulmonary disease: a lung condition inhibiting a person to exhale normally. Chronic bronchitis: a form of COPD that causes a chronic cough. Emphysema: lung damage that traps air in the lungs. Acute bronchitis: a virus that causes a sudden infection of the airways. Cystic fibrosis: a genetic condition that causes an accumulation of mucus resulting in repeated lung infections. Asthma: a condition where the airways are consistently inflamed, resulting in wheezing and shortness of breath. Interstitial lung disease: a collection of lung conditions that affect the interstitium. Pneumonia and pulmonary edemas: these lung diseases that affect the air sacs can also affect the interstitium. Stephen M. Black (above) and a team of researchers have uncovered a new therapeutic target for treating acute lung injury. Stephen M. Black and a team of researchers have uncovered information that could help with treatment for acute lung injury. A summary of their study recently appeared in The Journal of Biological Chemistry, where they noted that a bacterial infection can throw off the equilibrium of two key proteins in the lungs and also put patients at risk of a highly lethal acute lung injury (ALI). As Stephen M. Black explained in a recent press release, “Bacteria can alter a single amino acid in the protein RhoA, pushing its activity level well above that of Rac1 and prompting blood vessels to leak and flood thousands of tiny air sacs in the lungs.” Fortunately there might be a biological shield that is able to protect RhoA from potentially lethal alterations. While RhoA was believed to be a cause of ALI, researchers had not previously known how it contributed to its development. Other causes of ALI include severe trauma that induces shock; common bacterial infections such as pneumonia; meconium aspiration; burns; and multiple transfusions. Researchers used human lung cells and mass spectrometry to learn that amino acid Y34 was altered in ALI. They then utilized 3-D computer modeling to map out how Y34 alteration affected RhoA functioning. They learned that this process turns RhoA into a steady-firing protein. Stephen M. Black explains that patients can clear the bacterial infection with antibiotics and still die if they do not survive long enough for the body to go back to making normal RhoA. He and the other researchers will continue their research into Y34 as unanswered questions include how long RhoA can sustain the super-pace resulting from bacteria modification and whether non-bacterial causes of ALI will prompt the same RhoA alteration. Lipopolysaccharide Induced Lung Injury Involves the Nitration-Mediated Activation of RhoA. Acute lung injury is characterized by increased endothelial hyperpermeability. Stephen M. Black and the study’s other authors noted that protein nitration has been shown to be involved in LPS exposed mice in the endothelial barrier dysfunction but researchers had thus far been unable to identify which proteins specifically. This study resulted in identification of a new mechanism of nitration-mediated RhoA activation, which is involved in the LPS-mediated endothelial barrier dysfunction. Additionally, researchers were able to show the potential utility of “shielding” peptides in order to prevent RhoA nitration when managing acute lung injury. This study appeared in the February 21, 2014 Journal of Biological Chemistry. Dimethylarginine Dimethylaminohydrolase II Over-Expression Attenuates Lipopolysaccharide Mediated Lung Leak in Acute Lung Injury. Acute lung injury is associated with lung leak, inflammation, diffuse alveolar damage, and a loss of lung function. It has been shown that combining a decrease in DDAH and increase in ADMA in mice exposed to LPS can contribute to the development of acute lung injury. The study’s authors saw that DDAH II overexpression prevented LPS-dependent increases in ADMA with human lung microvascular endothelial cells. Additionally, they were able to demonstrate that targeted overexpression of DDAH II in vivo inhibited the accumulation of ADMA in the lungs of mice exposed to LPS. This data suggests that enhancing DDAH II activity could be a useful adjuvant therapy for treating patients with acute lung injury. This study appeared in the March 2014 issue of American Journal of Respiratory Cell Molecular Biology. Subscribe to this blog for future posts about Stephen M. Black lung injury/sepsis medical research. Over a medical research career that spans more than two decades, Stephen M. Black has conducted considerable research on a variety of topics. He currently has six ongoing research projects he is working on with his integrated cardiovascular laboratory at Georgia Regents University. One of the research projects discussed in Stephen M. Black’s most recent blog post, “Endothelial barrier protection and repair in acute lung injury”, is a Program Project, meaning that the Regents Professor is working with one or more of his colleagues at Georgia Regents University to complete the project. The project is comprised of four interrelated projects and three cores, which all use state-of-the-art biochemical, cellular, molecular, and physiological approaches. Stephen M. Black hopes that the Program Project will provide the medical community with a better understanding of the mechanisms by which RhoA (a small GTPase protein) and Rac1 (a protein found in human cells) are regulated during G- and G+-induced acute lung injury. This data should also help in the development of new strategies and treatments for acute lung injury, which has not seen a major drop in fatalities in over 40 years (learn more on acute lung injury here). Project 1: This project focuses on how protein nitration regulates RhoA and Rac1 signaling during the development of acute lung injury, and makes use of biochemical, cellular, molecular, and animal studies. Project 2: This project is thematically linked to Project 1, as it deals with determining how heat shock protein 90 (Hsp90) impacts RhoA activation and downstream Rac1 signaling. Project 3: The third project also focuses on RhoA and Rac1, aiming to determine the therapeutic potential of monitoring their expression both in a living organism (in vitro) and in a test tube environment (in vivo). Project 4: This project investigates the barrier disruptive effects of the G+ pore forming toxins, lysteriolysin and pneumolysin. The results should reveal the mechanisms of RhoA/Rac1 imbalance while exploring the therapeutic potential of enhanced NO signaling for restoring this balance during G+ mediated acute lung injury. This study aims to understand how endothelial nitrous oxide synthase (eNOS) signaling is regulated in the pulmonary system during the perinatal stage. Stephen M. Black hopes that gaining an understanding of how ET-1 interactions mediate changes in a child’s pulmonary blood flow (PBF) following surgery might improve peri-operative treatment strategies to reduce short and long-term morbidity and mortality among children with congenital heart defects (CHD). Abnormal structural development of the pulmonary circulation continues to lead to morbidity and late mortality for children born with CHD. Stephen M. Black hopes that this project will test the hypotheses that increased pulmonary circulation is due, at least in part, to a shear stress dependent increase in vascular endothelial growth factor (VEGF) expression mediated by increased activation of transforming growth factor-beta 1 (TGF-beta1), as well as that nitrous oxide (NO) plays a key role in the previously mentioned process. The resulting research will shed a light on which biomedical forces regulate the TGF-beta1/VEGF axis, which will help medical professionals such as Stephen M. Black develop new treatment strategies for children born with CHD. These are just two of the active research projects on which Stephen M. Black is focused. Learn more about his research by connecting with Stephen M. Black on Quora.